“Greyhounds are like potato chips; you can’t have just one.” How true! My husband and I planned to have only one dog. Our plans went astray and eventually the ranks swelled to our current four: three retired racing Greyhounds and a rescued whippet. Living with a pack of dogs is continually interesting. Just when we think the pack has finally settled into a predictable set of behaviors, something changes. We constantly have to reassess the dynamics and sometimes intervene. 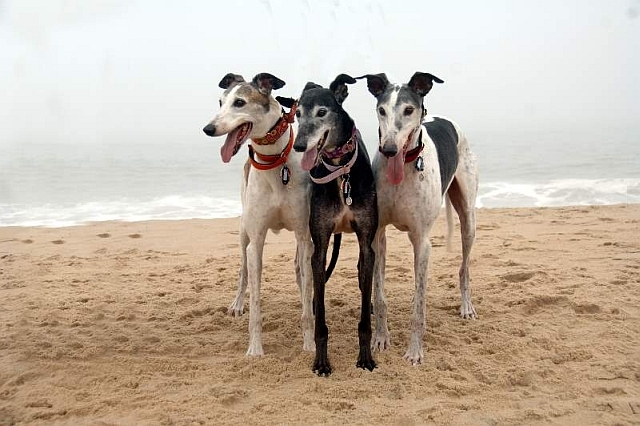 Many Greyhound owners either already live with a pack of dogs or are considering adding another dog to their family. Please remember that all dogs are pack animals. Even if you have only one dog, it already lives in a pack: your family. You and your family members have an established pecking order. Hopefully one of the humans in your family is the “Alpha” pack leader and not your dog! If your dog runs the house, get help immediately from a qualified dog trainer before you consider adding another dog. Otherwise, you could lose control all together! In our home, my husband and I are “co-Alpha” pack leaders, followed by Ginger, our first Greyhound. The lowest dog on the totem pole is Vox (a female), our third Greyhound. Vying for second in command are Fritz (our second Greyhound) and Flash (our last dog who is a slightly neurotic whippet). Ginger was easy. She adjusted quickly, but was lonely and became withdrawn. So we added Fritz. Ginger’s nose was out of joint for about three weeks. But since then they have been best buddies. We then fostered three dozen dogs — definitely an educational experience. Ginger and Fritz were a tight little clique and did their best to ignore the fosters. Ginger let any upstart fosters know that she was top dog. Then came Vox, the sweetest, most mild-mannered dog we’d seen. She had an arthritic hock from a track injury, so we were being picky about who could adopt her. Soon my husband was calling her “Babe” and I knew she’d be staying. Fortunately, Ginger and Fritz thought she was great. She knew her place — the bottom of the pack — and would let the other two take her bones or toys without even a snarl. A perfect fit! Finally, Flash the Whippet arrived…. We had become pretty self-congratulatory on our expertise in integrating new dogs into our house without much turmoil. Well, that little whippet came in and blew all our expertise out the window! We very quickly learned what “challenging the pecking order” meant: fights at any time, over anything! We talked to several obedience experts and took Flash to obedience training. After a lot of work, Flash settled down and stayed, but that’s another story. All during the ordeal of integrating Flash into our pack, I wished there was a book I could refer to. Such a book now exists and it’s called Living with More than One Dog by Carol Cronan (Canine Potential Publishing). This book should be considered mandatory reading for anyone with more than one dog. Another useful book is Carol Lea Benjamin’s Dog Problems which has an excellent chapter on multiple dog households. Before you add another dog to your house…. Think long and hard about whether you have the time and commitment to make it work. Each dog brings its own set of needs and problems. You won’t do the new dog any favors if you don’t have the time to help it adjust. If your first dog has any behavior problems (aggression, separation anxiety, housebreaking), adding a new dog may only aggravate those problems. It’s better to work with the first dog and get his problems under control before adding a new dog. Finally, consider whether you have the financial means to support the extra costs for food, supplies and veterinary care. How to add another dog to the pack…. Introduce the dogs on neutral territory when possible. New dogs are usually on their best behavior for the first month. After they have settled in and begin to figure out the pecking order, you can expect them to challenge it in some way. You can also expect your existing pack members to defend their status. Keep your eyes open and be prepared for trouble. Your existing dogs may be upset by the new addition. Give them lots of attention and keep an eye on your most dominant dog and perhaps the second in command. It’s okay for her to give the new dog a warning growl or two, or even display more overtly dominant behavior (mouthing the back of the neck or mounting), but don’t let it escalate to actual violence. I use my crates for “time-out.” If two dogs get too aggressive, they both get a scolding and are popped into a crate for up to twenty minutes. I let them out and if they start in again, it’s back into the crates. Usually, they emerge in a more civil mood. For at least the first month, put the new dog into a crate whenever you are gone. Your other choice is to muzzle all the dogs. I prefer to use the crate for a number of reasons, including housebreaking. Your new dog needs to earn its freedom to be trusted outside the crate in your home and with your other dogs. If you have a dog door, consider keeping it shut and the dogs confined indoors while you are gone. An unsupervised pack of dogs can get into a lot of trouble! Have lots of soft beds available in every area of your house. This way there will never be a shortage. Of course, your dogs may still compete for the spots they consider to be the best ones: your couch, your bed, or your lap. Have designated feeding stations for each dog and serve the dogs their food in pack order. Supervise feeding time and don’t free feed. We allow about ten minutes for all the dogs to eat their meals and then we pick up any left over food. (I refrigerate it and recycle it at the next meal). Very quickly the dogs learn that if they want to eat, they’d better get right to it or they’ll go hungry until dinner time. If you get a great new toy, strictly supervise the dogs’ play time. Someone will try to steal it from someone else and fur could fly! Don’t forget to put the toy away and out of reach when you leave the house. Otherwise, you could come home to an injured dog and blood all over the house, as I did. Fortunately, it was only a tiny nick to an ear which bled profusely. At first glance though, it looked as if Vox would need major surgery! This warning also applies to bones, rawhide chews, and any other item which might cause a dispute. When the dogs are outside in your fenced yard, pay attention to the dynamics. If you have a small dog, be sure the larger dogs don’t gang up on him during their play. It could be dangerous. Turn the small dog out by himself or with only one other dog. If you have an aggressive dog, turn him out by himself. If your dogs like to have a party (running, barking, etc.) and you’re concerned your neighbors may get upset, break the pack up into smaller groups or turn them out separately. When running your dogs (in a fenced area, of course) make sure they are all muzzled. Again, watch the dynamics. If you don’t like the thought of muzzling your dogs forever, try to analyze the pack makeup. If you have one dog that is particularly aggressive and snaps at the other dogs, keep him muzzled. If he likes to ram into the side of the other dogs, run him separately. Remember, Greyhounds are highly competitive dogs and some were retired because of their bad manners. If someone with a dog you don’t know asks if their dog can run with yours, decline politely or make sure every dog is muzzled. Always err on the side of caution. Greyhounds can be seriously injured very quickly. It’s just not worth the pain and expense. Make obedience training a top priority. You can’t control a pack of dogs unless you have control over each individual dog. You must work with each dog individually and then work on group control. A good obedience trainer or book can give you some ideas. I work on a group “sit” or “down” at treat time, as a I leash up the dogs for a walk or car ride, and before I let them outside. Don’t be afraid to get professional help if you are having problems. Don’t think that you must treat all your dogs equally! First, dogs are dogs, not children. Second, dogs respect a strong leader and need a predictable structure. If you try to treat each of your dogs as an equal you will have trouble. Instead, support the pack structure. Give your alpha dog the respect she deserves (usually female in Greyhounds, but not always). Feed her first, let her outside first, and so on. Don’t get upset when she takes away another dog’s toy or she kicks someone out of the bed she wants. Intervene only if she gets too rough. On the other hand, do find time to give each dog some special attention during the day. If you discover you have too many dogs to handle and properly care for, you must reduce the size of your pack. It’s not fair to the dogs, yourself or other family members. Contact your adoption group and return one or more of the dogs so they can be placed into a better situation. This same advice goes for the dog who really would be better off as an only dog.